I am delighted to be able to offer Willyne Hammerstein's beautiful third book. It includes 18 exceptional quilts by Willyne. 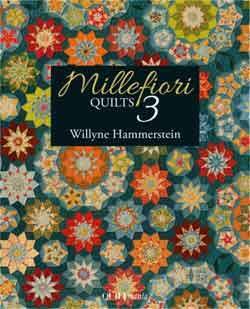 Millefiori Quilts 3 is not just for quilters who like English Paper Piecing. Willyne sews with a running stitch to make her wonderful designs. Some quilters are using English Paper Piecing instead. I recommend a running stitch, like Willyne. The shapes for Moncarapacho (the cover quilt) are the same as the Inklingo shapes for Ballet (Millefiori Quilts 2) and for Passacaglia (Millefiori Quilts). Stay up to date with news on the blog. There is a list of the quilts in Millefiori 3 which are Inklingo-able. GET READY TO FUSSY CUT! There are several articles on the All About Inklingo blog about fussy cutting with Inklingo for Willyne's designs. Please follow the All About Inklingo blog and Inklingo on Facebook for more info. POSTAGE $6.55 or $23.95 for ONE book. Details here. I can mail two books in the flat rate envelope for $6.55. If you order two books, the postage is $33.95 instead of $23.95. SEE THE NEW LOWER PRICES on Millefiori Quilts and Millefiori Quilts 2.